More than 23 800 pictures for you! Ashlee and Evan's Q&A on Twitter! Ashlee Simpson on Sister Jessica’s Pregnancy: ‘She’s Ready for That Baby’! It was date night Saturday for Ashlee Simpson and Evan Ross as they attended Clive Davis’ annual pre-Grammy party! Ashlee revealed she has never been to the Grammys before, but is going to see her mother-in-law Diana Ross perform. “I’m very excited,” she said. Incredibly, though nominated 12 times throughout her 60-year career in music, Ross has never won a Grammy. She received a Lifetime Achievement Award in 2012. Ashlee Simpson Ross (born on October 3, 1984 in Texas) is an American singer, songwriter and actress. She is known for having played in "7th Heaven" as Cecilia Smith. Then, Ashlee started her singing career and released her first album, "Autobiography" in 2004. It was followed by two others, "I Am Me" in 2005 and "Bittersweet World" in 2008. She also played Roxie Hart (in 2006, 2009 & 2013) in the musical, "Chicago" at the Theater. In 2018, she made her comeback : She appears with her husband (Evan Ross) every Sundays on 'Ashlee+Evan' on E! Their first EP, 'Ashlee+Evan', has been released on October 12th, 2018 and is composed of six songs : I Do, Paris, Safe Zone, Tonic, I Want You & Home. Ashlee and Evan were on tour on January 2019. On March 22nd, Ashlee and Evan released their new single from their second EP : 'Phases'. Ashlee is now working on her solo album. Name : No name for now. Info : A pop rock/soul record. 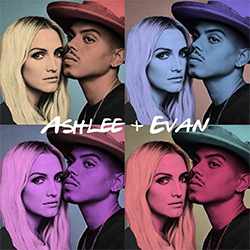 Discover the first EP of Ashlee Simpson Ross and Evan Ross called 'Ashlee+Evan'. It is composed of six amazing eclectic songs : I Do, Paris, Safe Zone, Tonic, I Want You & Home. Listen/buy it in every streaming platforms now : here. Find all the lyrics/videos of every songs : 'Ashlee+Evan's Music'. On March 22nd, their first single, 'Phases', has been released. Find the lyrics/videos of Phases : 'Phases'. Ashlee Simpson Ross and Evan Ross will go on tour next year. It will begin on January 7th, 2019. For now, they only give us the dates for North American, more dates will come soon! Ashlee Simpson Ross is currently working on her own shoe and handbags line called 'ASR3' in collaboration with her mom, Tina Simpson. Ashlee Simpson Ross and Evan Ross will be in Connecticut for a Q&A followed by a signing event in The Shops. Ashlee Simpson Ross will participate to one episode of the season 3 of 'Drop The Mic'. She will do a rap battle with Christina Milian. This new docu-series will follow actress and singer Ashlee Simpson-Ross and her husband actor and artist Evan Ross. We'll get an inside look into this young millennial couple as they try to balance life as new parents with a solid foundation of humor and love. Coming from two famous music families, Ashlee and Evan will take viewers inside the recording of their first duet album. Fans will see Evan's rising star in music and Ashlee cautiously jumping back into the music world. We will watch as they face challenges and success in their marriage and music while receiving the unwavering support from their legendary families and life-long friends. Where to watch ? : On E! Top Affiliates - Ashlee Simpson Daily ---------------------------------------------------  Wonderful Sophia Bush  Obsession27  Whitney Port Online  You ? Ashlee Simpson Daily is a 100% non-profit fansite. It is run by a fan of Ashlee Simpson who just wants to share informations about her with other fans. I am not in contact with her or any members of her team/family. All medias belong to their owners, if you saw your work on my website and want to remove it, contact me and I will.